Every once in a while I feel the need to assemble a post that's chock-full of links to things I'm pretty sure you'll find interesting... clicker at the ready?! Design*Sponge featured lovely paper cut illustrations Kate Forrester created as a holiday ad campaign for John Lewis department stores. 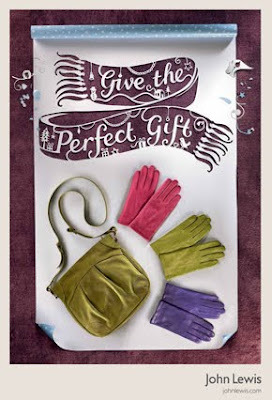 Ten typographic images of the merchant's seasonal slogan "Give the Perfect Gift" can be seen on billboards, buses, underground stations, and newspapers all around the UK. 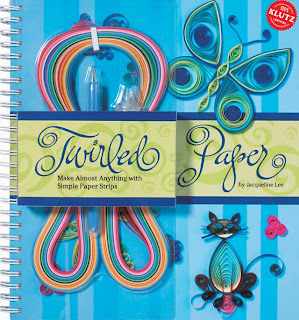 How awesome that paper art is making such a statement in advertising lately. oh my goodness! i learned quilling at summer camp eons ago but could never remember the name of it; thank you for the memory burst! it was so much fun and surprisingly good for 7-year-olds because it takes such intense focus. So there you go... affirmation that little ones can handle the challenge too. 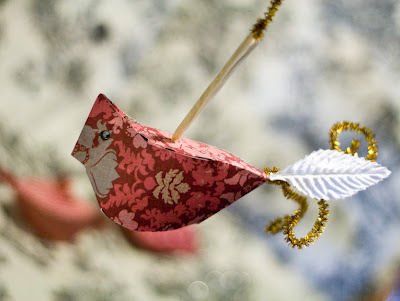 While checking out how-to links at Craftig [edit: site no longer available], I came across this clever little cardinal ornament designed by cheekymagpie. Print, cut, and fold... I'm thinking it would be a lot of fun to add some filigree wings and tail feathers. Hope I'll get a chance this weekend to make one. 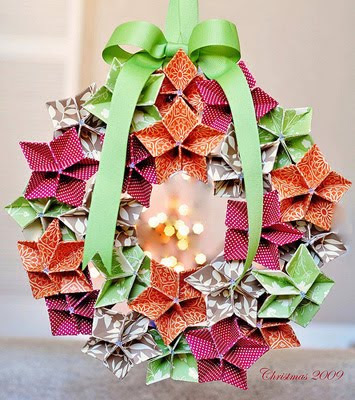 This pretty origami wreath by Maliah, was featured at Folding Trees [edit: site no longer available]. I love the fresh color scheme... if you don't have time to make one before Christmas, it would be perfect as a springtime decoration too. Maliah used scrapbooking paper from Target and the petal pieces are modified cherry blossom folds. Lastly, here's a really quick mixed media Christmas card tutorial I did for CRAFT this week... skinny ribbon trees with a retro flair. Be sure to check out CRAFT's site [edit: now Makezine] as it has a brand new look... all the columns and features of the former print magazine, but now with lots more content and it's wonderfully free! Thanks for the lovely post, Ann!